The noses of the bas-reliefs of two Jaina tirthankaras at Keezhavalavu have been smashed by vandals. SANGAM age Tamil-Brahmi inscriptions on the brows of caves, hundreds of beds known as Jaina beds sculpted on their floors, beautiful bas-reliefs of Jaina tirthankaras and exquisite paintings by prehistoric artists are facing destruction in the hills in the vicinity of Madurai in Tamil Nadu owing to large-scale granite quarrying and vandalism. Real estate sharks have destroyed Iron Age burial sites near these hills. The sites, datable from 2nd century B.C to 3rd century A.D., constitute an invaluable cultural treasure. The inscriptions offer evidence to Tamil’s classical language status and throw light on the advent and spread of Jainism in the Tamil Sangam age and the later period in the region. The sites hold a wealth of information on how kings, chieftains, traders, village chiefs and even ordinary people patronised Jainism and made donations for the sculpting of Jaina beds. They also provide interesting information on the trade guilds that existed during the period because many of these hills lie on the trade routes of that period. Quarrying has been going on at these sites in total violation of the Ancient Monuments and Archaeological Sites and Remains Act, 1958, and the Ancient Monuments and Archaeological Sites and Remains Act, 1966. The first one, a piece of federal legislation, applies to protected monuments under the control of the Archaeological Survey of India (ASI), which functions under the Government of India. The second one is a State law and applies to the protected monuments that come under the Tamil Nadu Archaeology Department. No construction or mining activity is allowed up to 100 metres of the prohibited area beyond the protected limits of the site. Beyond the 100 m, up to a distance of another 200 m, is the regulated area, where, under the terms and conditions of a licence granted by the Director-General of the ASI, mining or construction can be done if it does not affect the site. All these provisions apply to monuments coming under the State Archaeology Department, too. As per the procedure, the Assistant Director (Mines and Geology) of the district concerned, on behalf of the Collector, would auction the hill. The Collector would give the contractor who wins the bid a licence for quarrying. A letter dated September 23, 1996, went out from the Department of Tamil Development and Culture that “in future… the District Collectors should consult the Archaeology Department and only with its permission they should give the licence to private parties for quarrying the hills which have heritage monuments.” For, it said, “Tamil inscriptions, which are about 2,300 years old, are found only in the caves of hills. They provided the best evidence for learning about the Tamil Sangam age and the Tamil society that existed prior to the Sangam age.” However, the letter said, quarrying was under way not only to export granite but also to sell it locally. It is our nature to desire endlessly, because continuously we are seeing what others are having and wanting all that for ourselves..... For example: You go to the shop to buy a fan for your house. But on the way you meet some friends on the road, who tell you that they are going to buy some other things in other shops. Immediately, you are tempted to buy them and so you change your track and go and buy along with them. Then you find that you don’t have enough money to buy your fan! If you start comparing and living out others’ desires, you will land yourself in deep trouble because you will not know where you stand. Always measure yourself with your own meter, never with others’ meters. It is the most foolish and dangerous thing to do. There are 31 Tamil-Brahmi sites in the State, with 90 inscriptions. Of them, 11 are protected monuments under the State Archaeology Department and seven are under the ASI. Quarry contractors appear to have violated the provisions of both laws with regard to the protected monuments. Take for instance the Tamil-Brahmi site at Tiruvadavur, 20 km from Madurai, with two Tamil-Brahmi inscriptions and prehistoric paintings of concentric circles. This is a protected site coming under the State Archaeology Department. The inscriptions, belonging to the 2nd century B.C., talk about how Aridhan of Pangadu village and Upasan had sculpted the beds on the cave floor. Iravatham Mahadevan, a renowned scholar on Tamil-Brahmi and Indus scripts, deciphered the two inscriptions in 1996. Tiruvadavur is now the most disturbed Tamil-Brahmi site in the State, with a huge quarry situated right at the foot of the hill. Quarrying has progressed so deep that the site looks like an open-cast mine. All round the quarry, for several kilometres, granite blocks as big as a truck or a car, are stacked on either side of the village roads. There is a surreal scene too: a nearby hill has been sliced in half, as if it were a cake. An official of the State Archaeology Department admitted that quarrying was under way within the prohibited/regulated area, that is, within 300 m of the protected limits of the monument. T.S. Sridhar, Principal Secretary and Commissioner, State Archaeology Department, said that on paper nothing would be illegal. But after obtaining the licence, quarrying would take place right inside the prohibited/regulated areas. At the entrance to the historical site at Keezhavalavu village, 38 km from Madurai, an ASI board announces that the monument is of national importance. 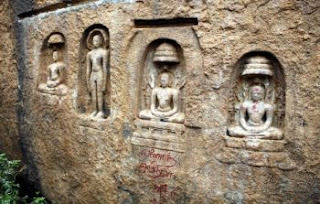 The hill treasures a long Tamil-Brahmi inscription chiselled boldly from right to left and some letters written upside down on the brow of a cavern; three sculptures of Jaina tirthankaras above the inscription; Jaina beds; and a little away, a line of six sculptures of tirthankaras. On an adjoining hillock, there is a series of Jaina beds; and two circular hollows, excavated from rock floors, with Tamil and Grantha inscriptions. The High Court granted an injunction and stayed the quarrying within the protected limits. A final order is yet to be passed. Vandalism, too, is rampant at Keezhavalavu. If the sculptures of the group of six tirthankaras remained unharmed when this writer visited the site in December 2008, the noses of two tirthankaras appeared smashed up during a visit in March 2009. There is graffiti everywhere. The ASI had erected two pillars to support an awning above the sculptures of three tirthankaras. The awning is gone and only the hideous-looking pillars remain, obscuring the view of the tirthankaras. The hillock at Melakkuyilkudi, on the outskirts of Madurai, is another protected monument of the ASI. Here, there were 10 Jaina beds, which commanded a beautiful view of the paddyfields below and the Nagamalai hill at a distance. But illegal quarrying has led to the collapse of the hillock. Falling boulders have splintered the beds. Today, only two beds remain intact. At Muthupatti, near Karadipatti on the Perumalmalai hill, there are three Tamil-Brahmi inscriptions, all belonging to the first century B.C. They talk about the donations made by Anthai of Nagaperur and Ilamagan Kodan of Musiri, and Saialan of Vindhaiyur for excavating the Jaina beds. This is an ASI-protected monument. Quarrying went on here within the prohibited/regulated limits but stopped a few years ago. It revived in recent months. However, after a vigilant Tamil press highlighted the fact, the District Collector stopped the illegal quarrying. Kongar Puliyankulam has three Tamil-Brahmi inscriptions on the brow of a cavern, more than 50 Jaina beds, which have been defaced with symbols of political parties and names of people painted or engraved on them, and a sculpture of a tirthankara. This is a protected monument under the State Archaeology Department. Two hillocks in this area have disappeared, with every boulder having been removed. Quarrying went on at the spot and created artificial lakes. Varichiyur on the Madurai-Sivaganga road, has on an amorphously formed hillock three Tamil-Brahmi inscriptions and some Jaina beds. Quarrying on the edges of the hillock has made the rock-cut Nilakantesvara shrine sit perilously. The six Tamil-Brahmi inscriptions of the 2nd century B.C. on the brow of five caverns on the Kazhugumalai hill near Mankulam, 38 km from Madurai, are the most ancient ones in Tamil Nadu and establish the historical facts that the Pandyan king Nedunchezhiyan ruled in the 2nd century B.C. and that Sangam literature dates back to the same period. The inscriptions also have mention about the trade guilds of the period and about a group of Jaina monks headed by Kani Nandan who stayed in the five caverns. While the vandals have spared the inscriptions, they have defaced the Jaina beds and pulled down the fencing around them. If this is the plight of protected sites, the situation at unprotected sites such as Tirumalai in Sivaganga district and Arittapatti near Madurai is worse. Since Madurai was the Pandyan capital and an important trading centre, Jaina monks chose the ancient town for the propagation of their religion. It was only in 7th century A.D. that bas-reliefs of tirthankaras began to come up near the Tamil-Brahmi sites and elsewhere. K.T. Gandhirajan, specialist in art history who recently documented the Tamil-Brahmi sites in Tamil Nadu, said, “It is at Mankulam, Arittapatti, Tiruvadavur, Mannarkovil, and so on that we get the evidence that Tamil is a classical language.” He is pained that the ambience of these sites are marred by the activities of quarry contractors, vandals and others. Sridhar said the State Archaeology Department was “totally helpless” in the matter. “We can only protect the monument by fencing it,” he said. Whenever the department discovered any violation it reported the matter to the district administration. When use of explosives in the Keezhvalai hill posed a threat to pre-historic paintings there and a temple at Perumukkal, the department took up the matter with the Collector and quarrying was stopped there, Sridhar said. The department had no punitive powers to bring the vandals to book. He suggested that involvement of the local community was the only way to prevent vandalism of the monuments. Sathyabhama Badhreenath is unhappy that the district administration does not consult the ASI when the rights for quarrying around a protected monument are granted. “We continuously write to the Collector or the Assistant Director. We give them a copy of our rules. I have written to all the Collectors with a list of protected monuments in their districts so that they are at least aware that there are archaeological sites of importance in their districts,” she said. She said she wrote to the Madurai Collector and was able to prevent quarrying at Keezhaiyur. A heritage enthusiast suggested that the ASI or the State Archaeology Department be empowered to grant licences for quarrying near protected monuments.